The only trace of the vice president came on a candy wrapper. Joe Biden may be considering whether to enter the race for president, but he sat out last week’s meeting of the Democratic National Committee. In his place, backers greeted a curious few in a hotel suite 20 floors above the official gathering, handing out chocolate bars wrapped with a stylized photo of Biden behind the wheel of a convertible and an “I’m Ridin’ with Biden” label. In any other year, a sitting vice president would have headlined such a meeting as the heavy favorite for the party’s nomination. 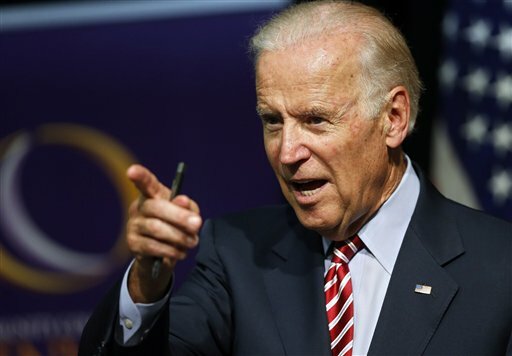 Instead, the gathering served as proof that if Biden choses to run, he’ll do so as an underdog to Hillary Rodham Clinton. Clinton’s years-long flirtation with a second White House campaign — time her allies used to lock up support of much of the Democratic Party’s leadership — and her undeniable political celebrity have upended the traditional script. Rather than inheriting his party’s machine, a Biden campaign would have to find a way to take it back. Yet Biden’s supporters see an opening, due in no small part to Clinton’s inability to shake questions about her use of a personal email server while serving as secretary of state. His candor, long history of fighting for Democratic causes and personal struggles — a widower at a young age now grieving over the recent death of his son Beau — make him an admired figure in the party. That group, a super PAC named Draft Biden, is a blend of Chicago-based fans of the vice president and political operatives with ties to his family. It sent five employees to the DNC meeting, emailing attendees and passing out fliers in hallways to invite people to their pro-Biden hotel suite. A total of about 75 came to four open-house sessions, said Josh Alcorn, a former aide to Beau Biden who joined the group with the family’s blessing. “People seemed excited about the possibility and were willing to take a look,” he said. Some Democrats who heard the pitch asked to stay in touch. Others remained skeptical. “I asked them, ‘What’s his path? '” said Mitchell Ceasar, a Florida attorney and party operative. Their answer — that he could cobble together votes from all sorts of Democratic coalitions — prompted a shrug. “The challenge to the vice president is to present a compelling argument why someone should get on a different train, a different train that’s going in the same direction,” he said. The practicalities of running also remain difficult for the vice president. His supporters say he must decide before the first Democratic debate, in mid-October. While Biden has no campaign operation beyond the small Draft Biden group, Clinton has for months built a sprawling machine of hundreds of employees working out of her Brooklyn campaign headquarters and in dozens of offices across the country. Her version of Draft Biden, a since-shuttered outside group called Ready for Hillary, spent years before Clinton got into the race amassing millions of email addresses of potential supporters. Money is another challenge. Biden represented the small state of Delaware in the Senate and has never raised significant sums for his own campaigns. Draft Biden, just a few months old, raised less than $100,000 through the end of June. While supporters say bigger checks have been rolling in recently, Clinton is a former first lady and senator from New York with a strong fundraising history. In the first three months of her campaign, she raised $45 million for the primary contest alone. Clinton’s team has also devoted significant resources already to wooing super delegates — the party and elected officials empowered to select the presidential nominee at the Democratic national convention regardless of the 2016 primaries. Clinton backers, who sported gold “H” lapel pins at the DNC meetings, were rewarded for their loyalty with invitations to private briefings from Clinton and top campaign officials. Ed Cote, a Washington state Democratic leader and a Clinton admirer, said that event was a perfect example of why Biden would find himself in a tougher primary than a sitting vice president might expect. Clinton learned the importance of that support in 2008, when she ended her long, hard-fought primary campaign after it became clear she lacked enough delegates to capture the nomination.